Paul Adams has an insightful presentation: The Real Life Social Network. It’s a great read, but it is a little long (224 slides)! Basically, he points out that the social network isn’t a fad, that it’s here to stay, and he goes through to talk about how relationships are, online/offline, behaviors, etcetera. Check it out if you have some time. Since I started using computers, there’s always been a yearning to connect with others online– through a social network in some way, shape, or form. I think it’s come a long way, considering I’ve been using the Internet for nearly twenty years! I want to share with everyone, my history of social networks. I was not a part of every one, but I can tell you about a great many that I was. Before AOL, my sisters and I used Prodigy and then Compuserve to get “online”. There were bulletin boards that you could post to back then, as there were no browser back then– at least I don’t recall there being any. This was during the time period between 1993 to 1995, I was barely a teenager then. We switched over to AOL because there was a social aspect to it. You could build a profile for yourself and chat with your friends on the very first instant messenger (IM). There were also live chat rooms (no video/audio of course). You logged in via the software interface given by the Internet Service Provider (ISP), and that was it. I never really used IRC back then. This was the social network 1.0 to me. I probably joined Asian Avenue my freshman year in college in 1997. I’m pretty sure my Canadian-Chinese roommate got me on it. It was a social network for Asians obviously. The site is still alive today, but it’s very different from how it was back then. My account no longer exists, as they terminated it without giving me any notice. I just recall it being somewhat of a game where the number of visits to your profile was rewarded with points that you could use to get a free Asian Ave hat, t-shirt, or some other prize. I never got enough points to get anything. This was barely a social network, as it was a place you could set up a basic website for yourself. I used this to start looking into HTML and post tons of animated GIFs of Dragonball Z characters. Hey, it was 1998! Today, the site is closed. Oh how I wish I could see my first webpage I designed! 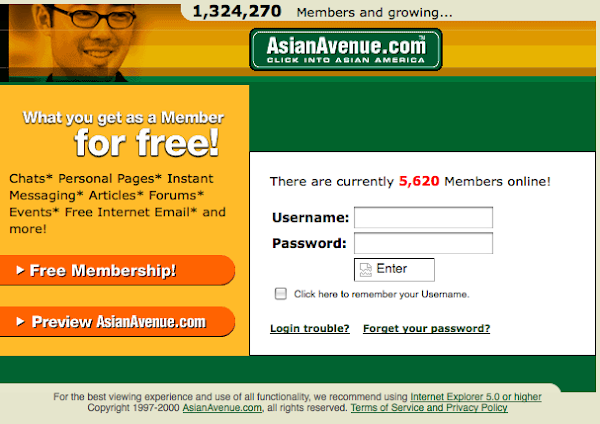 It’s worth mentioning because many of my friends had an Asian Ave site, but also a Geocities one they would link to. I’m no longer a part of this social network– if that’s what it’s intention was. I can’t even remember how I got onto this network back in college even. It may have been through email circulation. I don’t recall using it for anything whatsoever. I do recall getting tons of spammy emails though. I probably signed up for this around 2000/2001, and removed my account a few years later. I would consider Friendster the first social network that the masses of people actually used and became immensely popular. The problem was that it grew so much and so fast that their servers could not handle the load. It was down often or the site loaded very slowly. Soon enough people were messaging each other to leave and go try MySpace, where they said the site actually worked. Friendster is still alive today, although I think it’s weird how their login allows you to sign in with your Facebook account. I deleted my account shortly after joining Facebook, right around 2006. I was part of this social network for about… six months before deleting my account. I just got tired of all the requests from strangers to connect, not to mention MySpace had the ugliest site of all time. The culture, the way the masses abandoned Friendster for it– overall, as a user, it was a shady social network to be a part of. I disliked how so many companies and movie studios flocked to open up a webpage here. MySpace was getting more hits than Google at one point. Looking back now, it’s understandable why companies ran to set up a movie site there. It’s because they want a presence there and to be able to connect with their customers. This was a social network that many of my Thai friends used. I don’t think it caught on much with my other US friends. I left this site after realizing only my Thai friends were really using it. I think many Thais, starting in 2009/2010, started to leave hi5 for Facebook too. I like to consider FriendFeed the best social network that most people never knew about, or used. It was pretty isolated to just bloggers, social media giants, and techies. The service basically pulled all the different feeds (blogs, photo streams, tweets, etc), and put them into one. It never really hit mainstream, but that was what was great about it. It had culture and community all it’s own. Sadly though, they were bought out by Facebook in 2009, and since has become a ghost town. Google launched orkut around 2004. They created a lot of buzz (excuse the pun) around it by making it invite-only. A lot of people wanted to join, but they wanted to have it grow organically by only allowing members to to invite others with limited invites. This somewhat led to their demise as Facebook just got bigger and bigger at the time because most college email addresses were allowed in. I wanted to get into orkut so badly back then. Once I did get in, when they opened it up to everyone, it was already too late. Everyone seemed to have lost interest. Why would anyone want to be part of a social network that barely any of their friends were on? At least in the US it never took off. I still have my account on there, but it’s meaningless to me– and I’m assuming most of my friends that even bothered to join. These legacy social networks are either closed or ghost towns of what they formally were. I’ll have a part 2 of this where I’ll talk about the current social networks I’m a part of now.